Expedition climber Katja Staartjes: “Are you looking for an inspirational speaker for your organisation? My aim is to capture your hearts by my images and story. 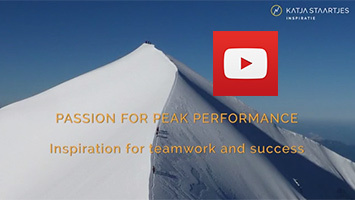 Based on my experience as mountaineer, expedition leader and manager I motivate your company to achieve top performance. Achieving peak performance requires focus and perseverance as well as the capacity to let go. And of course, whether it’s about climbing mountains, the business world or public sector, it’s all about team spirit & cooperation; you can not succeed as an individual. The lessons I learned in my Himalayan expeditions are powerful metaphors to the challenges at work & home. I use breath taking images from my expeditions to mountain peaks such as Mount Everest, and other 8000+ metres giants, to strengthen my story. This visual support ensures that the message makes a stronger and lasting impression. This gives your team the chance to really apply my story in practice. If you would you like an inspirational story with impact please complete the form or call Katja Staartjes (The Netherlands) at +31 6 212 742 82.